Back from Hawaii and back to reality! It was the most amazing perfect vacation I have ever been on. More details to come on that next week since I am going to dedicate that week to recipes that I was inspired by while in Hawaii. Right before I left to Hawaii, I made these cheesy bacon ranch potatoes. Slow cooked all day to be the most delicious and flavorful potatoes that you will want to have as side to every meal! This was my first time cooking potatoes in a slow cooker. Boy have I been missing out! They reminded me of tin foil dinner potatoes. Perfectly tender and packed with flavor. I can’t even describe how amazing these turned out! 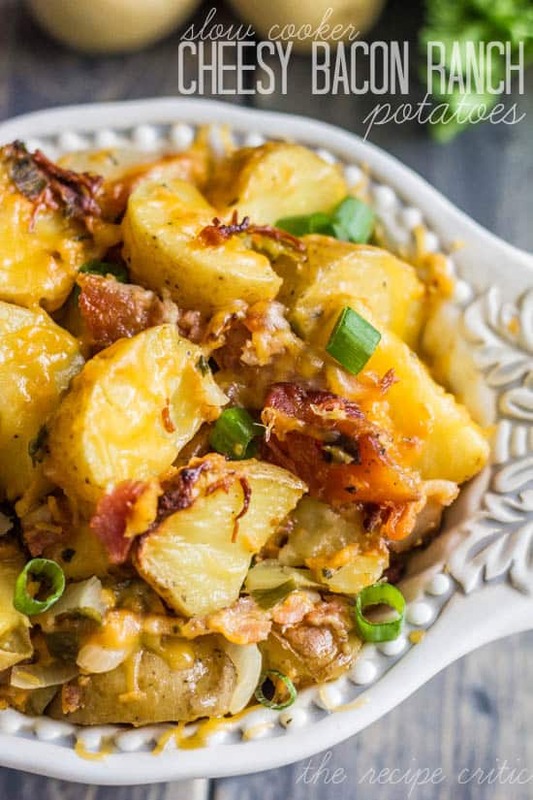 All of the flavors combined with cheese and bacon to create these delicious potatoes. While cooking in the slow cooker, they create the best aroma in your house all day. And when it is time for dinner, you just scoop them up and they really make the perfect side! A delicious side for any meal! Easy clean up and tender delicious potatoes that are packed with flavor! Does the bacon get crispy in the slow cooker? How long are the leftovers good for? All of these look amazing !! Usually leftovers are good for about 3 to 4 days depending on what the recipe is. We don’t have leftovers too often ;)! Can this be doubled in 1 crock pot for a larger family? This looks really good, and excited to try it. It’s in a package. I think it’s around the onion soup mix in a package, but not sure. Can you add some chicken breasts or burger meat to these potatoes? If I cook on high for a couple of hours will it still be good you think? I made these tonight right after seeing them on FB. I made 5 individual foil packets though, and then put the packets in the slow cooker. I have one little vegetarian and just left the bacon out of his packet. Followed the rest of the recipe exactly. They are absolutely amazing!!! Rave reviews after a hard-fought soccer game in the rain! Thank you!!! I absolutely LOVE this ! It is so simple (not to mention pretty cheap) ! My 7 and 3 year old helped make it, and had so much fun ! Thank you for sharing !! You will add the butter at the ended if needed. Can you substitute the ranch seasoning in the cheesy bacon potatoes? Or can you taste the ranch? You can taste the ranch but it is a slight hint and so good! Am new to this site….will be making this today!!!! Sounds OHHHH so good!!! Did you half or quarter the potatoes, or find some fingerling size to use? If I leave out the onions, will I need to add liquid? Recipe for slow cooker bacon ranch potatoes calls for 2T butter, but butter isn’t mentioned in the ingredients. Just wondering when to add it. You can but it will not give the right taste and texture. I would not recommend it. If you double the recipe do you have to cook it for a longer period of time ? 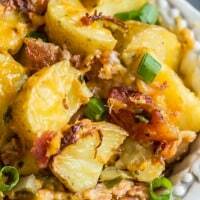 What/when do you use the 2T butter in the slow cooker cheesy bacon ranch potatoes? I’ve read through the recipe several times and only see it mentioned in the ingredients list. Is there a way to cut the grease? I’ve made this twice exactly to the recipe except the butter and it still comes out extremely greasy and just wet. It didn’t look like the picture. Maybe is it the cheese I’m using? Yes, the cheese can add a lot of grease. Hi. I love your recipes . Can this one be out into a slow cooker bag in stead of the alum foil? Can you use the bottle of ranch? You can use a bottle of ranch but it will come out moist rather than crispy. It is a preference and a great idea too to add that extra flavor. If you try it let me know how it turns out!